James Rocco's Broadway Songbooks have quickly become a staple of my theatergoing season. The Songbooks are warm, chatty, and filled with interesting anecdotes about musical theater, as well as musical numbers sung by a richly talented cast and a band led by Raymond Berg. I love how much James Rocco's love of theater comes through in every show. "Tonight we'll take a step back in time and explore the 1970s, a period of time when the classic form of musical theater began to deconstruct. Sometimes referred to as the "Me" decade, the 70s exploded with diverse forms of pop music that grew out of society's cultural individualism." 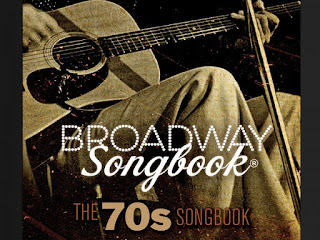 The 70s Songbook presents music from such songwriters such as Joni Mitchell, Carole King, James Taylor, Billy Joel and Elton John, in addition to some of the more standard musical theater offerings such as Company, Pippin and A Chorus Line. The amazing cast includes Dieter Bierbrauer (always a treat), Caroline Innerbichler (a standout from the recent The Pirates of Penzance), Kersten Rodau (James Rocco's muse, I think), Randy Schmeling (fabulous as always), and Erin Schwab (we'll get to her in a minute). Although I prefer the musical theater songs to the pop songs, any show that ends the first act with Erin Schwab and Kersten Rodau singing the fabulous Donna Summer/Barbra Streisand disco anthem "No More Tears (Enough is Enough)" is complete genius. I have to say this out loud: Erin Schwab is a Minnesota treasure--I think it's time for her own Minnesota Originals show. Also, she was ROCKING a super sparkly dress. So very sparkly. Not to be all spoilery (too late), the other utterly transcendent moment from this show was Randy Schmeling singing "Corner of the Sky" from Pippin. I love seeing Randy Schmeling in any role, but I really loved hearing him really sing this song. His voice was clear, gorgeous, powerful, and he sang the HELL out of that song. Oh, and one more thing: Hearing Kersten Rodau sing "Could I Leave You" from Follies made me long to see her cast as Mrs. Lovett in Sweeney Todd. She would rock that role so hard. With fabulous performances by all, the 70s Songbook is a delightful night at the theater. A small quibble though: I have loved seeing representation in other songbooks by actors and singers of racially diverse backgrounds. I hope to see that again! I love by how The Ordway has really stepped up their game in terms of non-traditional casting--especially with the recent Damn Yankees and A Christmas Story. I'm crossing fingers for the same in the upcoming The Sound of Music.